This page provides you with Ceo resume samples that you can use for inspiration in writing your own resume, or for creating one through our easy-to-use resume builder. Below you'll find our how-to section that will guide you through each section of a Ceo resume. As a CEO or chief executive officer of a company, you’ve surely put on multiple hats - not only you’ve been great at delegating with others to oversee the running of daily tasks but you have also contributed when a decision regarding the business had be made. Recruiters want to see a CEO resume that showcases the best of their abilities and creating a resume for a CEO position can be easy when you know how. It can be a disaster if you have no idea, though! Resumes are the window into you as a person and a professional. 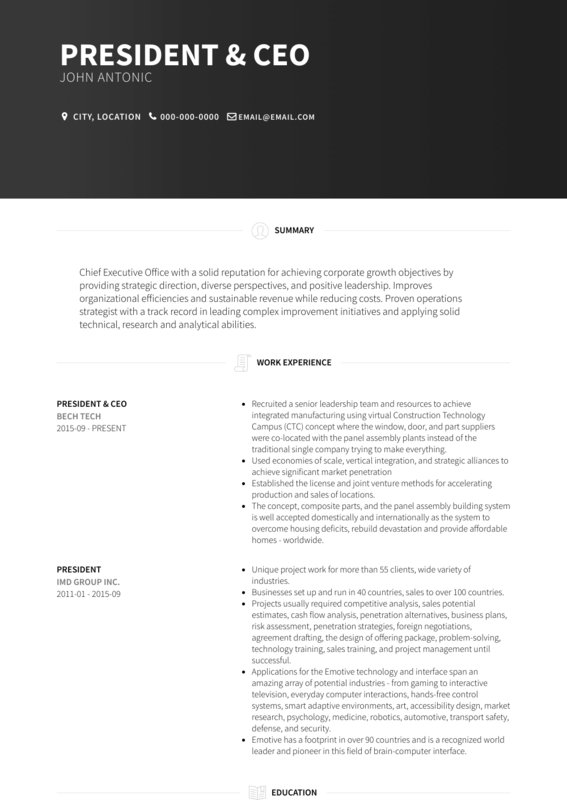 Anyone looking to apply for the role of a CEO must take the time to construct their resume in a professional manner. The resume you send to recruiters will say so much about you and it’s vital to have a unique resume that will stand out amongst hundreds. Don’t worry, we have lots of experience in helping thousands like you with the best CEO resume sample in the market. Let us inspire you and get ready to succeed! How to Write a CEO Resume? As a CEO you have multiple qualities: you’re a leader, you have lead businesses and set examples for those further down the chain and you are able to understand economics, even payroll and bookkeeping as finance plays a crucial role in any business. These qualities are often required from a CEO and we want to make sure you highlight those. As a CEO, you have experience and you are successful: we want to make sure your resume broadcasts this message loud and clear! Let’s start from the format: there’s no doubt the gold medal here goes to the reverse-chronological layout: it presents your freshest wins up front. Friendly tones are far better than a simple fact-to-fact style as it can often be off-putting. What is more, you don’t want to add a funny undertone rather a serious but warm undertone instead. The type of fonts used must also fit the style you’re aiming for: use clear, powerful fonts. Unfortunately there are some fonts which are difficult to read and that’s off-putting. Instead, a basic font can be more impressive than one which is impossible to understand. It’s the same with the colors used in the resume. Using several colors to highlight the more important elements can appear to be a good decision on the surface but deep down, it’s a very bad idea. Employers can think it’s a bit childish to have a rainbow of color on the resumes. Stick to one very basic color, usually black, and you’ll find it works far better. Use big headings too, matching them with clean white space. And now, listen: Grammar check please! Recruiters would never give a company to someone who doesn’t care or does not pay attention to details. Last but not least: PDF is the way to go, in order to preserve its formatting, whereas MS Word can be dangerous as a snake in Australia! Summarize the types of jobs you’ve had which relate to CEO. Talk briefly about duties you’ve been responsible for previously. Avoid ‘bigging’ yourself up, recruiters don’t always like it. Avoid words like, ‘when I’m CEO’, it looks pretentious. Avoid writing a list of every achievement you’ve made since junior high school. Recruiters who like what they see will go onto reading about your work experience and it’s this which can absolutely bring you to an interview. What experience you list can get a recruiter interested but also ensure you don’t get forgotten amongst the many other applicants. What should be added? Well, your recent work history for a start. What positions have you worked at recently and what sort of experience did that provide you? These things must be added simply because it’s showing a recruiter why they should pick you. What is more, the history of your employment could allow a recruiter to say for certainty you’ve got the experience to work as a CEO in their organization. Tell them what qualifies you as a CEO. The qualifications you have must be included. Always discuss your most relevant work history. Don’t add more than three previous employment information especially if they have been long-term positions. Don’t lie on your resume, eventually someone will uncover the lie. Don’t stretch your resume over four pages, two is sufficient. Education simply shows the person you are and where you’ve started, so please make sure you include it in your resume. Which schools you have attended. What you have studied in the past. How long you have studied and what were the outcomes to those studies. Resumes can be a bit sparse when it comes to education but it’s not the worst thing imaginable for a recruiter to spot when looking at a resume. Any educational training you’ve received or undertaken could be added as it will help to make your education look more impressive. Again, lots of people haven’t gone to college and if you haven’t, it’s nothing to be ashamed of and don’t lie about it either. Don’t forget, recruiters prefer honesty to lies. Screening remains an important element of any recruiter as it allows them to remove the OK candidates from the serious ones. You have to look at the type of skills you’re adding onto the resume and ensure the ones you add are the most relevant ones to the position you’re applying for. Keep honest with your skill set so that you don’t look foolish if you get found out. We understand and know what skills to add to your resume. You need to ensure your skills are relevant to the position you want to reach and also that are true. However, people often forget to add their soft and hard skills and that’s a problem. These skills will make a real difference to any recruiter. A cover letter usually is welcomed by recruiters. Follow our tips here. DO (make yourself look great) - Keep your language neutral. - Ensure talents are listed along with your skills. - Hobbies can be added to bolster your attraction to recruiters. DON’T (embarrass yourself) - Don’t attempt to be the funny at the bar on your resume. - Don’t assume you’re the one and only - Don’t add skills not suited to the position of CEO. If an excellent CEO Resume sample is not enough, why don’t you check out one of the most efficient CEO resume templates here : many professionals like you have successfully used it to take their career to the next level.